‘The Incredibles’ is not just one of my favorite superhero movies, which it is, one that I will happily hold up as a shining example of the genre, but one of my favorite films of all time, my most likely answer when (as most cinephiles are) asked what my favorite film is. I was torn about the prospect of a sequel, equally eager for more as it always seemed like one of the most obvious choices of any Pixar film to be given a follow-up, while also worried any second film couldn’t possibly be as good. So the big question, is it as good as the first? Immediately after the events of the first film, the Parr family have broken the law by using their powers, causing widespread destruction. Moved on and told to lay low, Mrs. Incredible is encouraged by a wealthy sponsor to go against the anti-super law, resuming hero work with the goal of having the law repealed, but finding a new foe in the Screenslaver who can entrance people through screens, even supers. Is it as good as the first? For me personally, no it’s not. Thankfully though it’s not hugely far off, by no means a disappointment, there’s more than enough to like about this second adventure with the superpowered Parr family. I’ve now seen the film a couple of times, though only once was in a cinema, and I had the company of kids who really loved it. All but one of them were not even born when the first film was released, and the one that is old enough didn’t see that film at the cinema. 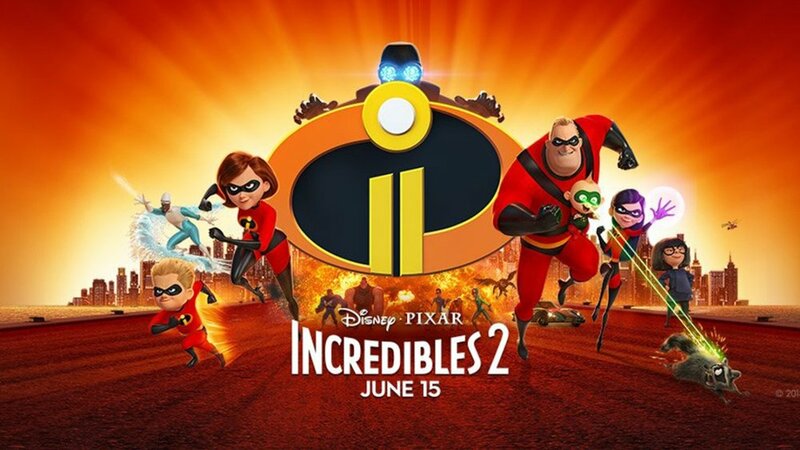 ‘The Incredibles’ is something that kids have been introduced to by their older siblings or parents, at home, on DVD, and have loved as much as those of us who can vividly remember the experience of going to see the first. It’s one of my most detailed family cinema-going memories. My parents didn’t like the film, they told us so over pizza afterward, my siblings and I heartily disagreed with them. My love for #The Incredibles’ only grew over the intervening years with each time I rewatched it, becoming as I said at the outset one of my favorite films of all time. Firstly, I’m so glad it picks up where the last film left off. Though there would have been a lot that could be done with the story if it were to resume a few years later with Dash, Violet and Jack-Jack all a bit older, those characters would have changed from the ones we know and love from the first films. As it is, the story does allow for some development in their characters that has just come as a rapid change rather than by growing up over intervening years. Centrally there’s a gender role reversal to differentiate the plot of the film from the first while keeping it within loosely the same familiar and trusty formula. Helen takes the lead as the Parr family’s moonlighting hero, shaking up the family dynamic. Elastigirl was presented as very strong and independent right from her introduction in the first film, so seeing her reclaim her own heroic identity with some modernized upgrades is a clever way of developing the story. It also puts Robert in the position of caring for the needs of the family at home, something he rapidly learns is more difficult than stopping bad guys and leads to more of the perfectly-observed family drama, and humor, that makes this super family so wonderful. Some of this drama and humor involves Jack-Jack, the baby with a diverse and odd set of abilities that his family were so far unaware of. I love how as a toddler he has these powers he doesn’t quite know how to control, he can use them a little to his own advantage but there’s no finesse, like a baby trying to walk and talk, he’s going for it but he’s a little unsteady and not always getting where he wants to be. It also puts an interesting angle on the whole superhero genre, where heroes often acquire their powers later in life or in the case of genetically inherited powers they often manifest at puberty. Seeing a baby using his powers as he does the rest of his faculties is so entertaining and he gets most of the best purely comedic moments of the film. Screenslaver is an interesting villain, clearly founded on a bit of zeitgeisty social commentary. Though it’s fundamentally a little strange to be suggesting that screens are bad in a blockbuster movie, the concept works pretty well, their machinations are well-reasoned and firmly founded. I don’t think it’s as good a foe as Syndrome, a very different personality comes across without the same charisma that made him such a fantastic foe to watch our heroes contend with, far less unhinged than he was which for me was a little less interesting and also really easy to unmask their true identity. The twists and reveals are not particularly surprising but that’s coming from me, a cine-literate adult, so maybe it worked better for younger viewers? There’s a superfluity of superheroes at one point, with a wide gamut of abilities. Some of these were great and added to the story and especially the resolution, a couple just fell completely flat for me. I would have preferred a very small number be introduced but fully developed so we could care about their role in the story, their lives as illegal superheroes, and maybe even have new favorites to look forward to seeing return in a future installment. I don’t think we get much of that at all, only one hero, Voyd (voiced by Sophia Bush) comes close to memorable but even I had to IMDb her name a second ago. Also, I could always do with more Edna, I love Edna and can never get enough. There is a lot more of her in the animated short on the home media release but still, I’d love to see her be given a role in the story that keeps her integral to the film for a bit longer than a couple of brief, though packed, scenes. There will be a third Incredibles movie, that is if Brad Bird develops a story he’s happy with which may take a little time, though I do think it’ll come quicker than the nearly 14 years it took for this sequel. While it’s not quite as brilliant as the first film, I have to admit that I’ve seen that one dozens more times which has developed and strengthened my affection for it, so it has a distinct advantage. In no way does this sequel spoil the original, which so many shoddy follow-ups seem to do, so I’m more than a little relieved and willing to give it a few more viewings to see if I can find more to love as I did with the first. ‘Incredibles 2’ has been nominated for the Best Animated Feature Oscar at the 2019 Academy Awards. In any other year the smart money is on the Disney/Pixar movie, though I think this year it’s in quite substantial doubt as there’s another superhero animation that has swung in and now seems likely to take the statue. This entry was posted in Film, Oscars 2019 and tagged 2018, animated, animation, awards, comic, comics, Disney, dvd, family, film, films, hero, movie, movies, Pixar, superhero, superheroes. Bookmark the permalink.